Grilling a whole chicken on a charcoal grill is all about indirect heat and the result is absolutely fantastic tasting chicken. There's something about cooking a whole chicken, versus the individual parts, that keeps everything so juicy and tasty. The picture below says it all. That's the exact setup I go for every time. Pan under the chicken, coals off to the side, and have a chimney ready to go again to reload up some coals because this can take awhile (about an hour) to cook. There's no lighter fluid in this picture - especially for long and slow cooks. Discard the neck and giblets and cut off any extra fat. Rise the chicken off and pat dry with some paper towels. Cover the chicken in the rub generously. I usually end up using some butchers twine around the legs so they don't flail all over the place. Put it on the grill over indirect heat and make sure and put something under it to prevent flare ups. 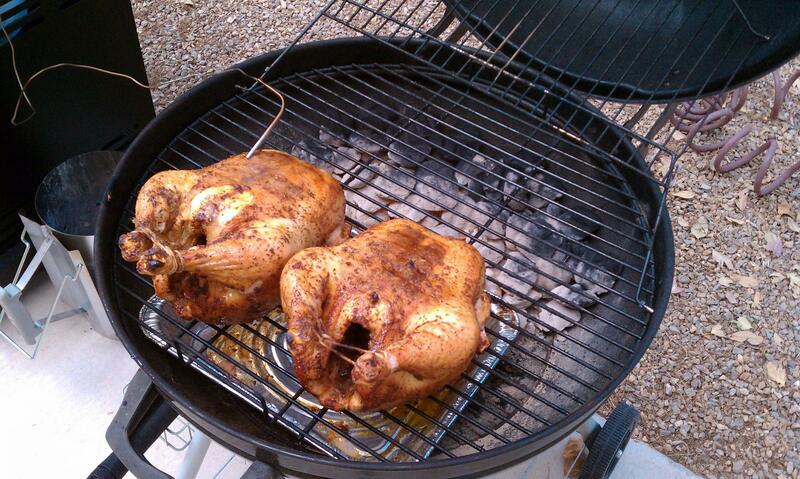 Rotate the chicken over the course of about an hour in every way evenly so you get an even cook. In other words, face the chick north, south, east, and west, and then flip the chicken over and do it again all while trying to keep the grill closed as much as possible. When the internal temperature in a meaty part of the chicken hits about 165F to 170F, take it off the grill and let it rest for 10-15 minutes before cutting into it.